Sunlight filtering through trees, beautiful but somewhat cliche. So I asked myself the questions I ask others to ponder. What drew me to this? What is the essence of that, that turned my head or called to me? What was it, in that moment of perception, that made me stop? Then, I made an image that captured what that moment of perception was. 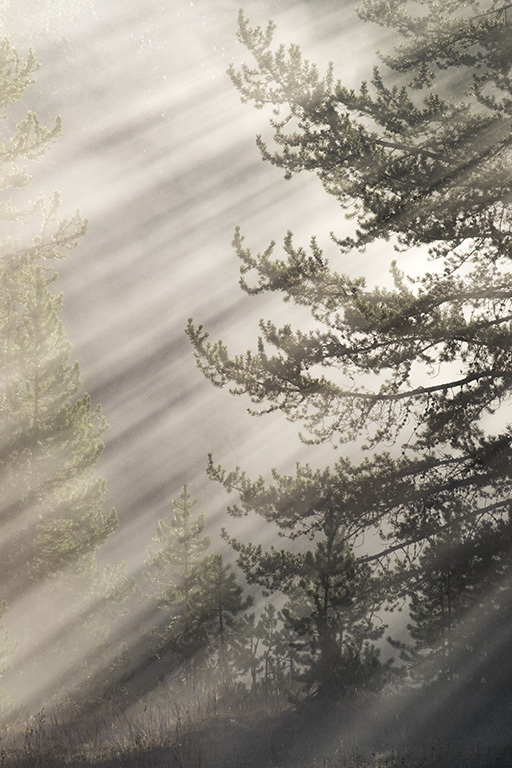 In this case, it was the dance between the fog, sunlight and evergreens. Great shot John. I love the fog and sun contrast. This photo is cliche, but it’s cliche for a reason. No one ever tires of the beauty of filtered light thru the trees. An image like this is on my bucket list. Thank you Anna Jo. Go to the Smokies in the Spring. Typically good opportunity for this kind of thing to happen. Then of course Yellowstone too! What a wonder-filled dance!!! So glad the scene turned your head… and not only a dance of fog, light, and evergreens but a dance of simplicity, mystery, and beauty!!! Thank you Kris. Well said! Love the simplicity (zen) of this photograph. Wonderfully done and with the perfect name. Thank you Robin. The name just seemed to fit. Very different and a real beauty. Congrats! Yes, the plot line (sunlight filtering through trees) is a generic cliche. Though the fact that it “turned your head & made you stop” indicates that it’s not yet cliche to you. As long as that’s true, that the plot line is cliche is IMHO not enough of a reason not to take the image. Your feelings for the scene show through & that’s why it’s as good as it is. Yup, always love getting comments from the thoughtful Marty! Great observations Marty. I agree! And thank you or the ind comment too. I find the way the sunlight is filtering between the trees beautiful and different. The first time I glanced at this in my email I thought it was either an image combined with a texture or an image of still trees superimposed on an image of some type of motion or panning. It is only when I went to the website that I truly saw what it was. There is truly something special in the way that sunlight is filtering through in straight lines. I love it! A magical captured moment! Great to be there when it all comes together, you witness it unfold and are able to capture “that” moment and preserve in pixels! Magical indeed! Fantastic atmosphere…perfect for the scene!